Weddings are one of the most universal traditions, but every culture celebrates them a little differently. Get inspired for your own nuptials with these wedding traditions from around the world. Picking a wedding date is extremely important in many countries. Chinese couples customarily consult fortune-tellers and astrological calendars. South African couples commonly schedule their weddings around a full moon. Like many other wedding traditions around the world, these customs are done for good luck. Whatever method you choose, the idea is to find for the most auspicious date to begin married life. As if your guests needed any more incentive to attend your wedding, make like the Czechs and sweeten your invitation with cookies. Whether you follow this tradition to a tee with a Czech recipe or apply the concept to your own favorite baked goods, this tradition is sure to be a hit. Why choose one dress when you can choose three? In China, brides often wear a traditional wedding gown during the ceremony, a more modern version for her entrance to the reception, and a shorter, cocktail-type dress when she is ready to hit the dance floor. In the Netherlands, it’s common to start the party before the ceremony. Many Dutch couples host a small pre-wedding cocktail party to kick things off. This is a great way to calm the nerves and sets the tone for a more relaxed day. America is one of the last parts of the world where asking for cash can be considered taboo. Italian brides often provide a satin bag for contributions. Indian wedding invitations generally specify no boxed gifts; code for a cash preference. In China, it’s customary to gift crisp, new bills in a red envelope. Requesting and gifting money is the norm in many countries throughout Europe, Asia and the Middle East.Cash gifts help couples get a good financial start to married life and make it easy for guests who are unable to attend to send money from other parts of the world. Popular in many parts of the world, couples are often sent into married life with a celebration that lasts longer than one day. In fact, in some cultures, weddings can last over a week. Take a look at some of the countries where weddings can last longer than they do in America. 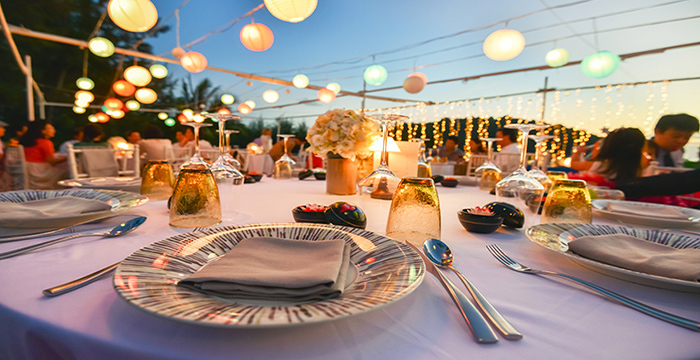 A week-long wedding may be considered excessive in the U.S., but a weekend of activities is a good starting point - especially for destination weddings. Guests at some Australian ceremonies are given decorative stones to hold during the ceremony as they make wishes for the couple’s future. At the end of the wedding, the stones are placed in an ornamental bowl or vase for the couple to keep and display at home. In addition to your photos, these ceremonial stones are a nice, tangible keepsake to remind you of your special day. In Sweden and Norway, it’s customary to assign a “toastmaster” to introduce each speaker because so many guests prepare words for the bride and groom. The wedding party, parents, friends, and even extended family often share memories, stories and well-wishes. If you want a speech-filled wedding, encourage all of your guests to speak up and designate someone to keep the speeches moving along smoothly. Popular in both the U.K. and across the southern U.S., the Ribbon Pull is a tradition for your single guests -similar to the bouquet and garter toss. The big difference is that the Ribbon Pull holds fortunes for more than one guest. Also known as Ribbon Pulls, this tradition involves placing silver charms inside the wedding cake for single female guests to pull out before the cake is cut. Each charm represents a different prediction, with a ring charm symbolizing the next to be married. Originating in Poland, the “money dance” has been adopted by many cultures around the globe. In this tradition, guests are invited to lineup for a brief dance with the bride or groom. To participate, anyone who wants a dance makes a contribution towards the couple’s honeymoon. In some countries, like the Ukraine and Greece, money is pinned to the bride’s dress or veil, while in Portugal and Hungary, the bride puts her shoes in the middle of the dance floor for collection. This custom is a fun way to make sure you get time with all of your guests and start your marriage on the right financial foot.